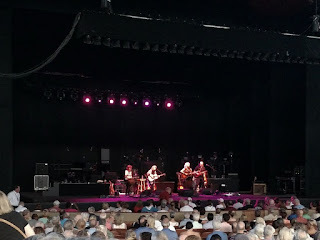 I'll get back to the Shore Leave posts soon, but in the meantime, here's a few notes from the Lyle Lovett and Emmylou Harris concert at Wolf Trap National Park for the Performing Arts on August 12, 2016. Emmylou Harris opened the show accompanied by Chris Donohue, Mary Ann Kennedy and Pam Rose. Harris' band is just the opposite of Lovett's Large Band—only four people with minimal percussion, which is well-suited to her folk/country style. Emmylou Harris started her set before the sun was just setting. After Emmylou finished, there was a short break to finish setting up the Large Band, then Lyle came out and jumped right into Church. The Morgan State University Gospel Choir is on the left behind the piano. 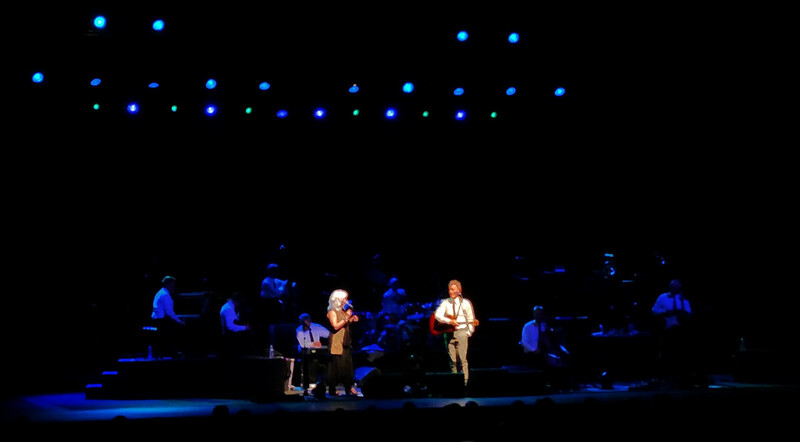 Emmylou Harris and Lyle Lovett preparing to perform together. During the concert, there were several mentions of singer/songwriter Guy Clark, who recently passed away. Both Emmylou Harris and Lyle Lovett had worked with him and greatly admired his talents. Although I wasn't particularly familiar with either performer's work, I had a good idea how Emmylou Harris' show would go. 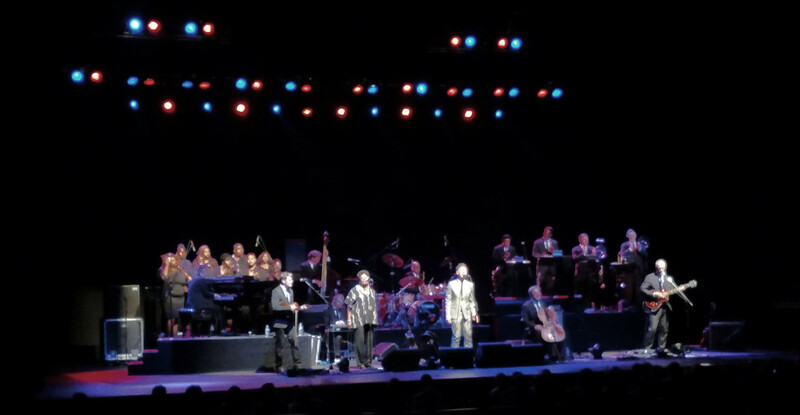 I wasn't as prepared for the gospel-style songs from Lyle Lovett, backed up by the Morgan State University Gospel Choir. Let's just say it gets a little more lively when he starts up! Morgan State University is just around the corner from where I lived for a number of years. I even did some work there once, but that was many years ago. 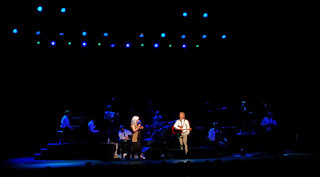 The show varied between having the Large Band on stage to just Lyle and one other musician, and he did a few songs with Emmylou Harris. 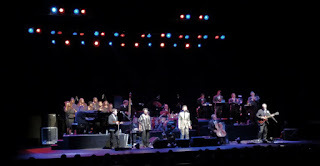 I wasn't sure about this concert when I bought the tickets, but I came away a fan of both performers. 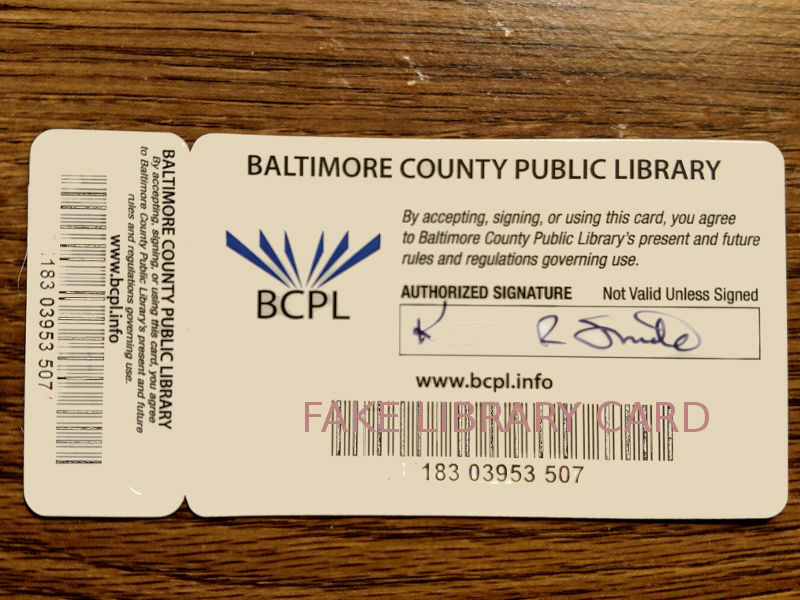 I picked up my new library card this evening. I had to go to the library to get it. That might have been a mistake. It's been a while since my last visit to the local library, and I was unprepared for the culture shock. The change was noticeable upon entry. The large desk, previously attended to by several ladies all feverishly working to check books in or out, was missing. In its place was one small desk manned by a young metrosexual sort of fellow. He was pleasant enough, and able to retrieve my card for pickup with little effort. He then proceeded to inform me where the adult section was (Adult section? What makes him think I'm an adult? ), where the movie DVDs were, and where television show DVDs were located. You can take those out for a week. And, oh, there's some fiction and non-fiction stuff over back there, too. Over back there? Do you mean actual books? I looked around. There were approximately a dozen computers and every station was occupied. One person wandered through the area shelved with real books, perhaps just getting exercise. Maybe I'd passed into the Twilight Zone when I entered. 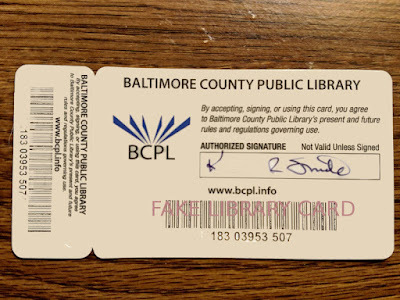 Is this the way all libraries are these days? When I get some free time (you can hear me laughing, can't you) I'm going to go back and read a book. Right out in public where they can all see me. That could cause quite a stir! "Mommy! What's that man doing over there?" "Shh, honey. Don't look at him! It just encourages that sort of behavior." I hope they don't take my card away. It's barely broken in.